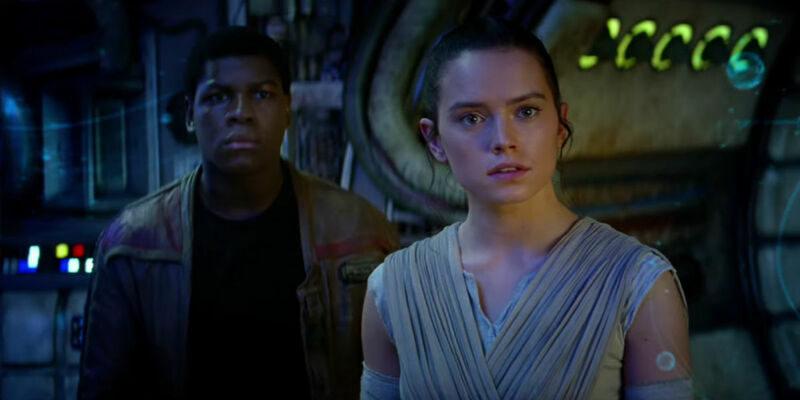 The new trailer for Star Wars Episode VII: The Force Awakens, and already there is buzz in the air. So much so, that even preordering tickets on Fandango and AMC have crashed both websites from so many orders. When I first saw this trailer, my eyes teared up a little. It evoked such emotion from my past with Star Wars and my deep love for the films. And, after view the trailer multiple times, I have a few theories about the film. For starters, the voiceover at the beginning: who was the female voice that was with Rey (Daisy Ridley)? Well, I think that it is the voice of actress Lupita Nyong’o, who will be playing space pirate Maz Kanata. This could imply that Maz has a much bigger role within The Force Awakens. It also shows that this film will be centering on Rey and her journey with AWOL stormtrooper Finn (John Boyega) and Han Solo (Harrison Ford). In retrospect, this trailer confirmed one of my theories about the film’s main villain, Kylo Ren (Adam Driver). Kylo Ren is in fact trying to emulate iconic villain Darth Vader (James Earl Jones), not knowing that Vader redeemed himself at the end of Episode VI: Return of the Jedi. There was also a hint of what Kylo Ren could look like near the end of the trailer, where the back of his unmasked head was seen about to lightsaber duel with Finn. However, there was something else that I noticed. The hero of the story, starting his journey on a desert planet, where something crash lands and causes the events of the film. A resistance movement trying to fight off a tyrannical empire. Doesn’t that sound like the plot for Episode IV: A New Hope? I know that the filmmakers and director J.J. Abrams want Episode VII to have the spirit of the original trilogy, but will they outright copy the first film’s plot? I am hopeful that they do new things with this. Whatever this film may become, I cannot wait for Star Was Episode VII: The Force Awakens to release December 16, 2015.